Since my Johnny Winter homage went over like a lead balloon, or Led Zeppelin as I like to say ;-), lets bring it back down into normal photography again. With a horse, of course. 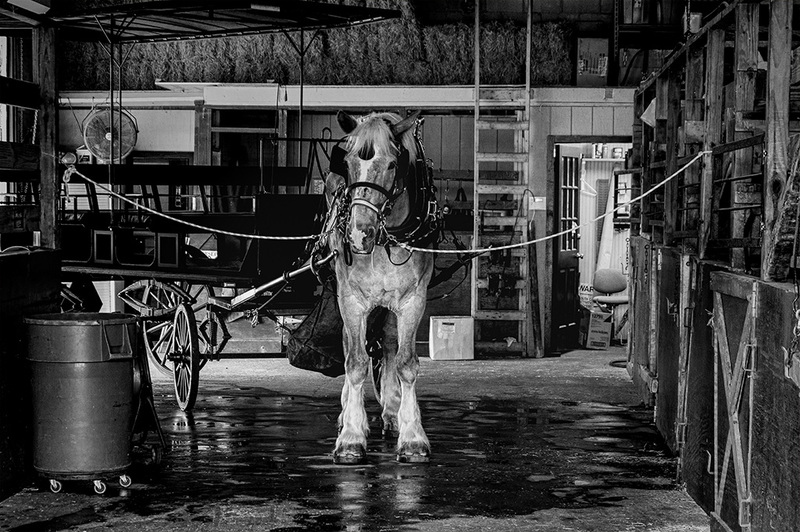 A simple black and white image of a horse in the stable getting ready for tour duty with a brand new wash. It looks like I am two-thirds into my July daily post mission and things are going smooth. Trying to take or find pictures of interest to post has been a challenge but so far, so good. The writing part is another story though. I like the horse photo. (The animal is remarkable.) I like the JW blog post too. Thank you Bruce. The horses are quite remarkable, and HUGE. My guitar-centric posts usually have limited immediate appeal but get steady views over time through internet searches.